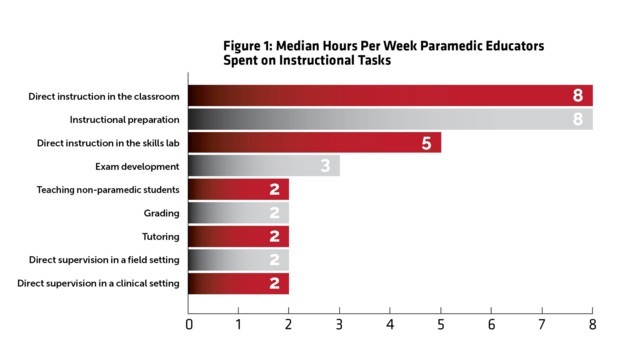 Are Paramedic Program Educators Overworked and Underresourced? Paramedic educators play a critical role in advancing EMS education, with their responsibilities often extending far beyond the classroom. While a 2005 study led by University of Toledo professor Judith Ruple described some characteristics of EMS educators at all levels, no previous studies have specifically explored the work of paramedic educators at a national level.1 In an effort to gain a better understanding of this profession, the National Association of EMS Educators (NAEMSE) teamed up with the National Registry of Emergency Medical Technicians (NREMT) to design a research study that would explore the workload of those who lead initial entry-level paramedic programs, as well as the resources available to them. A random sample of 300 paramedic program directors was selected from the NREMT database to participate in our study. Since we were interested in paramedic educators, we asked all individuals from this sample whether they were responsible for teaching the greatest number of didactic and skills lab hours at their current entry-level paramedic program. If not, we asked the individual to provide contact information for the lead instructor. Only lead instructors were included in our study. We sent an e-mail link to an online survey containing 86 items related to educator workload, resources and demographics to our national sample of paramedic educators. We sent two additional reminder e-mails after the initial invitation to participate in our study. A total of 68 (22.7%) educators responded to the survey. Table 1 displays the demographic and work-life characteristics of the educators who responded. Most of the educators who participated in our study were male (76.3%) and the average age was 54 years. Nearly half of paramedic educators had a master’s degree or higher (44.7%), and a little less than one-third (29.0%) said they were currently enrolled in higher education. The majority of educators in our study worked at post-secondary institutions (69.1%) followed by governmental education or medical services, such as fire or EMS agencies (10.3%). Among educators at post-secondary institutions, most worked for two-year colleges (66.0%). Less than one-third of all paramedic educators in our study were tenured or on tenure track (27.8%). Among all programs, the median time to achieve a paramedic certificate was 52 weeks, with a median annual enrollment of 24 students. Paramedic program faculty consisted of a median of two full-time paid educators and four part-time paid educators. A total of 23.7% of educators said at least one volunteer taught in the classroom or skills labs at their program. The student-to-faculty ratio ranged from 1 to 15 students per educator. Educators were assigned to work a median of 25 hours at their paramedic program in a week. However, the results of our study suggest paramedic educators are actually working far more hours than assigned. Educators reported working a median of 57 hours per week, with 56% of those hours spent on instructional tasks. Figures 1 and 2 display the breakdown of educator workload by instructional and non-instructional tasks. Perhaps not surprisingly, many of the educators who participated in this study were dissatisfied with the current paramedic program workload (40.5%).